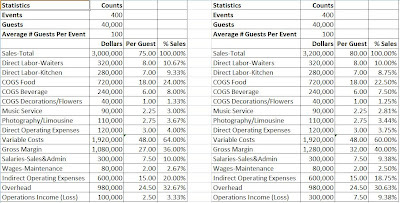 One hint I have shared with my special event catering clients is the use of cost per guest statistics (vs. a % of sales). Catering is a very different business. Using restaurant metrics is a mistake. Contract caterers say: "We take dollars to the bank not percentages." Since the caterer's guests often buy a complete package, it is helpful to detail the list of offerings and services provided and cost each one. Many of the line items are straightforward. You can use your previous cost data to fill in the blanks. The key to success is an accurate account of paid guests (or covers). We'll take a look at a sample company's budget process. The left hand side is the current results and the right hand side assumes we raise the price per guest $5. I use both Per Guest and % of Sales statistics. You need to use the contracted guest count since the final counts are often lower (due to no-shows). Since the fixed costs are covered by revenue per contracted guest, this is a better divisor. Many caterers expect a lower count and prepare less food. Other companies prepare enough food for 100% attendance. The use of cost data per guest makes sensitivity analysis (what if?) easier to present to your management team. Each line item may be changed to see the impact on profit. In the example above, I assumed costs would remain constant and the entire $5 increase would make it to the bank.